The Punjab government could not keep its promise to open Kalma Chowk for routine traffic on 10th January. Motorists are facing the worst traffic situation due to extensive construction activities. Kalma is one of the busiest intersections on Ferozepur Road that connects a number of important residential and commercial localities. 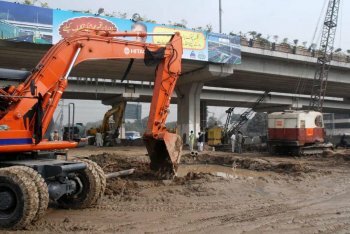 The intersection was closed for 20 days for the completion of a small stretch of Metro Bus System corridor, a bus station and Kalma Chowk underpass. The closure of the intersection has intensified traffic congestion in the city, provoking people to criticise the construction of a number of projects. Keeping in view the current construction status, the intersection is unlikely to be opened by 25th January. An official said that traders, school goers, government and private sector employees are the worst hit segments due to the prevailing situation and the concerned department does not care their miseries. The closure is not just wasting precious time of the citizens but also increasing their mobility expenses. Therefore, everyone is waiting for the opening of underpasses and the intersection.